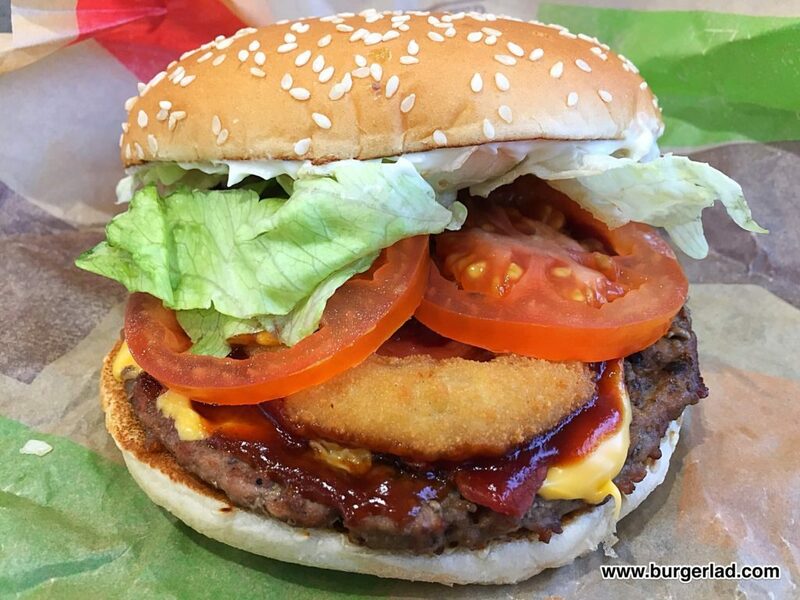 Whopper bun, Whopper patty, 4 slices of bacon, White Cheddar Cheese, BBQ Sauce, Onion rings, Lettuce, Tomato and Mayonnaise. 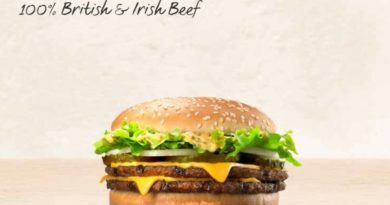 Burger King is back with a new set of promotional burgers, which include the California Chicken Tendercrisp, the Chicago Angus and this, the Texas Cheddar Whopper. 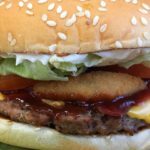 On the face of it, we recognise these burgers – we’ve had very similar names in the Route 66 promo before – and last year it was the Texas Crunchy Whopper with an additional potato rösti patty. 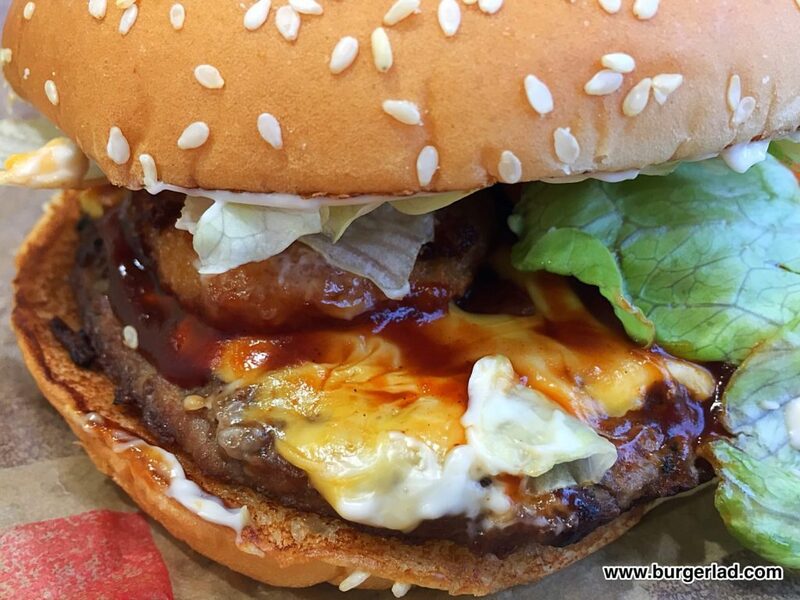 This year, the offering from Texas is foregoing the potato to take more inspiration from the Rodeo burger (one of my, and BL’s favourites at Burger King) which of course is anchored by BBQ sauce and onion rings. These “Texas” ingredients are transferred to the Whopper and there you have it, the 2017 Texas Cheddar Whopper, and I must say it’s rootin’ tootin’ good. OK, I’ll stop with the cowboyisms now, but truly I enjoyed this. And let me tell you all about it. It was presented in the usual Whopper wrap which always seems to make it look smaller than it actually is, especially in the large paper bag mine was in. 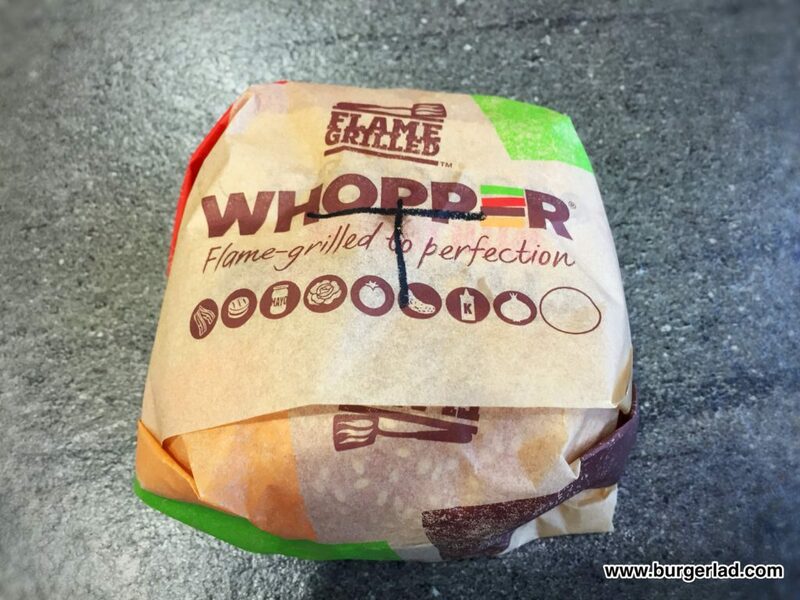 The Whopper isn’t a small burger though – you can tell that from the price and the diameter of the thing once you’ve unwrapped it. 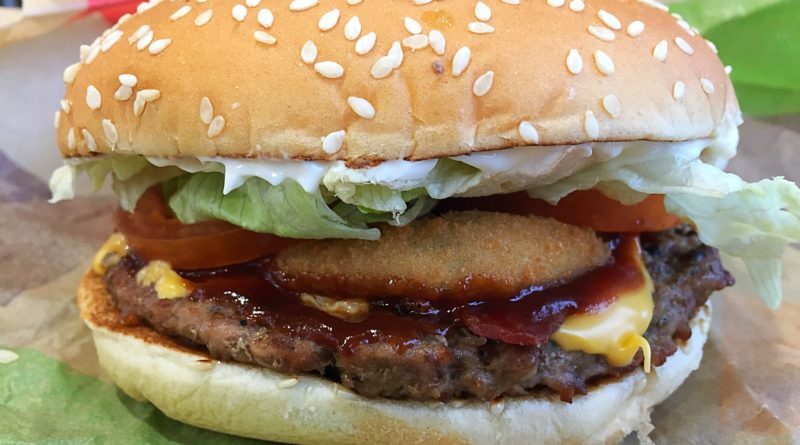 Plus, in this case, there are SEVEN ingredients to top this Whopper. Strangely, once it was unwrapped, its height didn’t seem to demonstrate these seven ingredients but upon inspection they were all definitely there. One little note, with having this burger a day before public release, the White Cheddar that will normally be on it, hadn’t yet arrived, so they told me mine would have American cheese instead. That’s fine, but just bear in mind the more unique notes of Cheddar will slightly alter the background of this burger compared to the one I had. 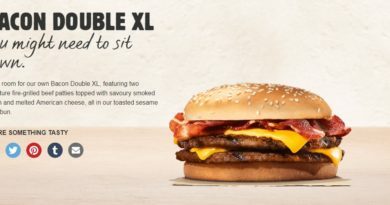 In retrospect, it would have probably been better to re-visit BK on release day to have this with the proper cheese, due to it being a vital component. I must say I like that and personally I like the combination of that and BK’s own fries, whichever burger I happen to be having. Tucking in, again I got that flame-grilled taste and settled in to enjoy this. Visually, the tomatoes were extremely apparent and not that long ago I’d have dived straight in to pick them off. But tomato is one of the intended toppings, so these days I tend to leave them in. The other marmite ingredient is mayo. It suits my taste, but let’s just say that mayo isn’t always the most amorous condiment to others. It was a few bites in before I got the BBQ sauce on the Texas Cheddar Whopper. This build hadn’t overdone the sauce, which is a good thing. Too much BBQ sauce kills a burger and this one had it just right with its smoky sweetness taking me back to BK’s Rodeo. The naming of these burgers is often a bit of a stretch with poetic licence, but in this case the association of Texas with BBQ sauce is strong enough to be justifiable. The onion rings presumably represent the loops at the end of cowboy’s lassos? 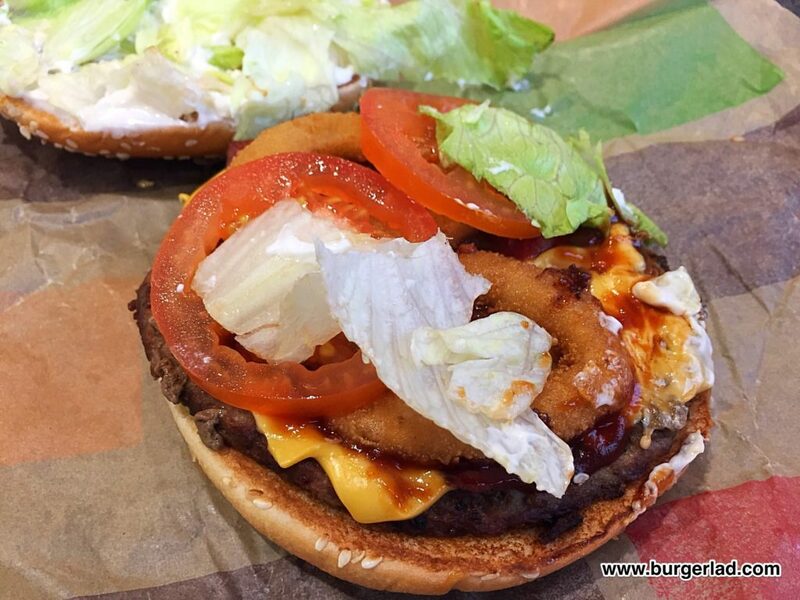 At any rate, these onion rings, whilst clearly present on the burger, didn’t stand out taste-wise. Perhaps they aren’t quite as plump as they could be. However, there’s a lot going on in here and it probably isn’t very surprising. Getting further in, something very unique happened. I tasted the lettuce. 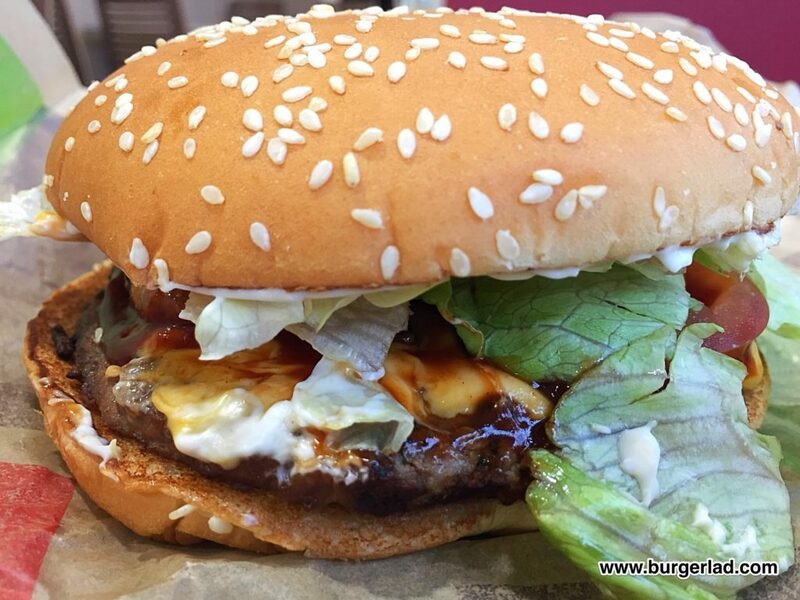 Both BL® and I say this often – you never taste the lettuce on a burger. But this time I did. It tasted like lettuce. However, lettuce isn’t really there for the taste, it’s there for the look, and here it looked fresh and had been applied in what looked to me like the right amount. Lastly, in this build, it was actually a struggle to get the bacon. Yes, it was most certainly in there, but I had to concentrate hard to get it, although once I did, it remained throughout. So in summary, it’s the BBQ sauce which runs the show here, without dominating. It is kept in check both by the correctness of its volume and the mayo which acts to mute any sweet overtones. 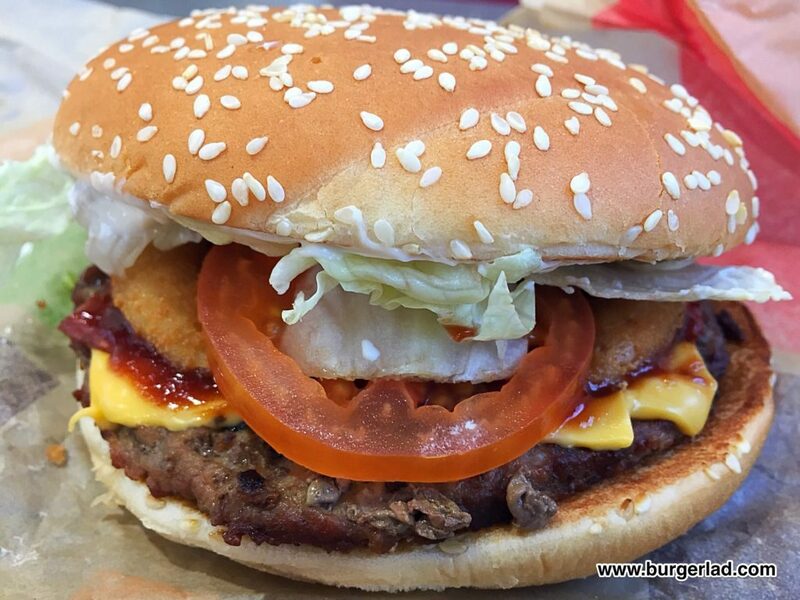 As a result what you have is a very respectable promotional Whopper build on the solid grounding of BK’s flame grilled flavour – there’s a reason they use that as a USP in their marketing – it is actually there! 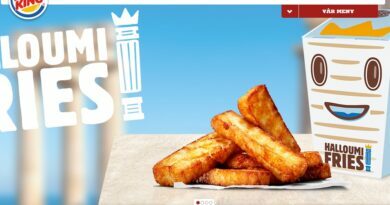 I’d be inclined to shorten these BK promos to a maximum of two months, not least to match more closely their good friends at the Arches, but also to keep the brand fresh. But that said, whatever the timescale, a new promo from BK is always something to look forward to. Thank you very much to BK for letting me have this early and get it out to you first.